half-dozen or so generations of Americans as the man in the Monopoly game, not all that many people are aware he even has a name. At first glance, one might place Pennybags alongside Uncle Scrooge, Mr. Abernathy and Richie Rich, as one of the world's wealthiest cartoon characters. But considering he's practically floored when he benefits from a bank error of $100, carries his belongings in a bindlestiff when advancing to Illinois Avenue, and repeatedly languishes in jail despite the fact that a mere fifty bucks would spring him, we must conclude his apparent affluence is mostly sham. But he seems to have a lot of fun pretending he's rolling in dough. And so do players of his game. The official story has it that Monopoly goes back to 1933, when Charles Darrow, one of millions of unemployed victims of the Great Depression, invented a game in which everyone could be a wheeler-dealer in the world of high finance. His claim was contested by inventors of extremely similar earlier games, such as Finance and The Landlord's Game, but that's another story — we're talking about Rich Uncle Pennybags. Darrow submitted the game to Parker Brothers, one of the world's largest game manufacturers, but it was rejected with a claim that it contained no less than 52 design errors. Undaunted, Darrow, aided by a printer friend, hand-produced sets and sold them to local department stores. Over 5,000 sets were sold this way, and before long Darrow was unable to keep up with the demand. But despite all those alleged flaws, Parker Brothers was quite willing to take on a proven success. By 1935 it was the best-selling game in America. Since then, an estimated half-billion people, in all parts of the world, have played it, and it still enjoys brisk sales. 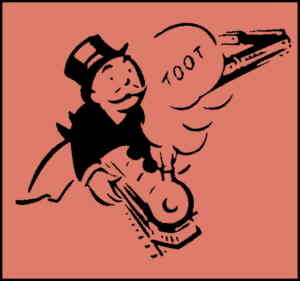 Rich Uncle Pennybags wasn't part of the game's design at the very beginning, but was added early on and immediately became inseparable from it. In 1940, Parker Brothers spun him off into a second game, titled Dig, and six years later starred him in a third, Rich Uncle. The latter remained in production through the 1950s. He was spun off again in 1985, into a new game called Advance to Boardwalk, which is still being played tho it never reached Monopoly's heights of popularity, and yet again in Free Parking. In 1990, a game called Monopoly Jr. featured a square titled "Rich Uncle Pennybags Loose Change". He also bears a more-than-passing resemblance to Colonel Mustard, one of the stars of Clue, also a Parker Brothers game (tho Mustard's image is rendered in considerably more detail). Pennybags has appeared as Christmas tree ornaments, give-away toys at fast-food restaurants, refrigerator magnets and many other forms of licensed merchandise. He's made a couple of guest appearances on The Simpsons, as an acquaintance of the incredibly wealthy J. Montgomery Burns. In recent years, special editions of Monopoly have used other toons, such as Scooby-Doo, Peanuts and The Justice League of America in their board and card designs. But even there, Rich Uncle Pennybags can be seen in the logo on the outside of the box. In 1968, Parker Brothers was acquired by General Mills (which put him on the box of Monopoly Cereal in 2003). In 1991, after several changes of ownership, the whole conglomerate wound up in the hands of the toy manufacturing giant, Hasbro (whose other toon properties include Jem & the Holograms and G.I. Joe, no relation). In July, 2000, Hasbro, in an apparent effort to render its property bland and prosaic, officially changed the name of its most popular game's star to "Mr. Monopoly". But since practically nobody knows the character's name anyway — so what? To anyone who cares, his name will never be anything but Rich Uncle Pennybags. Text ©2003-07 Donald D. Markstein. Art © Hasbro Games.